A total of 44 inch sizes offered from 0.1200" to 0.7812" diameters. Available in 2xD, non-coolant through. Gash land for stronger corner. Steels, stainless steels, cast iron and aluminum. Applications that require drilling into: angled surfaces, curved surfaces, shoulder drilling, thin plate drilling, intersecting and eccentric/cast hole drilling. New "Z" type thinning lowers the thrust force and provides excellent chip evacuation. 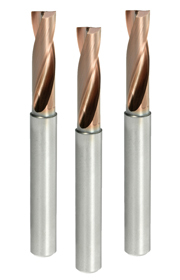 Wavy cutting edge combines two different radius sizes which provides a strong cutting edge and excellent chip control. Gash land for stronger corner (with 0 degree rake) provides excellent chipping resistance. Smooth surface clearance provides reduced deflection and excellent position accuracy.